Over the past three years, Thatcher Hall has collected over 7,000 books. This year, our Service Committee for grades 3-8 challenged their peers to donate 1,500 books for our annual book drive. Our students looked on their book shelves and brought in gently used books. In true tiger fashion, we broke our record and brought in 4,113 books. 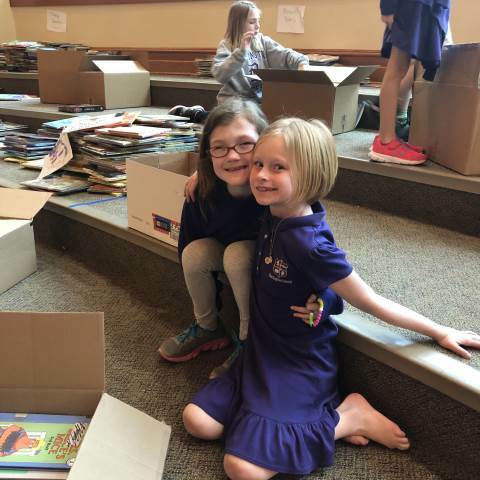 On Wednesday, 32 students stayed after school sorted, counted, and boxed books to be delivered over the next few weeks to local schools and agencies in the city. We thank everyone who donated their time and books. Together we are sharing the gift of reading.